Excerpted from an article at CNET by Alfred Ng. “I am trying really hard to make this nuclear bomb shelter feel like a home. The room is small, just enough to fit a bunk bed, a padded bench, a ladder in the middle and an air filtration system, but not much else, not even a toilet. I’m looking for where I could put books, or at the very least, a stash of canned beans and bottled water to stay alive. I’m a little uneasy. Maybe it’s how cramped it feels in here. Maybe it’s the metal ladder interrupting the feng shui of the room. Or maybe it’s the fact I’d have to live in this nuclear bomb shelter for the rest of my life if the apocalypse ever struck. I’m inside a showroom version of the BombNado Disaster Shelter in Montebello, California, to see what it’s like living in a nuclear bunker. If it were real, I’d be deep underground. But instead, I’m out in a metal box next to Interstate 5 during a heat wave. Bomb shelters are no longer a relic of the Cold War. Back then, schools and cities around the country conducted air raid drills as fears of a nuclear war between the US and the Soviet Union reached a fever pitch. 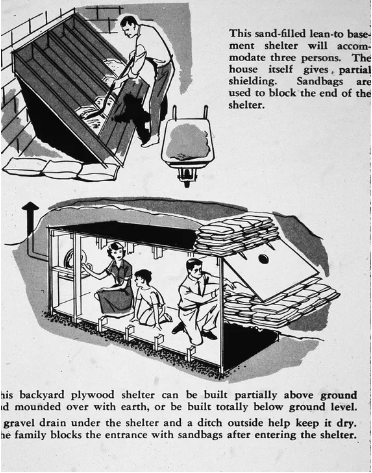 In 1962, the Department of Defense even printed a handbook for building fallout shelters in your backyard or your basement. Now there’s second boom (no pun intended) in demand, fueled by rising political tensions; worsening wildfire, tornado and hurricane seasons; and fears of terror attacks. Atlas Survival Shelters told Germany’s Die Welt newspaper that it sold 1,000 shelters in 2017. Real-estate paper The Real Deal reports that Rising S Company, in Texas, saw 700 percent growth in international sales last year, mainly in Japan. Bomb shelter makers tell me customers range from Silicon Valley’s tech billionaires to working-class homeowners who want a safe place to hide in case of disaster. You can still build your own shelter, or now you can just can buy one. Prices start at $19,000 (the cost of the BombNado), but they can go as high as $8.3 million. For $19,000, you get the basic bunker, about 8-by-8 feet, with a bed, toilet and an air filter — essentially a dorm room. Higher-end models can be more luxurious than most homes and include pools, hot tubs and shooting ranges. You can add surveillance systems, too, if you’re willing to pay the price.